The GDT™ degas separator is a patented centrifugal vortex unit that separates entrained and stripped gases from liquid (water) based on the density difference between the gas and liquid. Its unique compact design quickly and effectively separates unwanted entrained gases–such as ozone, chlorine, or methane–and requires far less space than traditional gas separators. 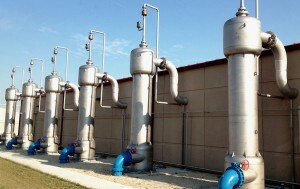 It enables gas separation with pressure differentials of 5% or lower and at variable flows. The self-cleaning design significantly reduces maintenance and downtime, and it includes no moving parts that can wear out, break down, or require service. 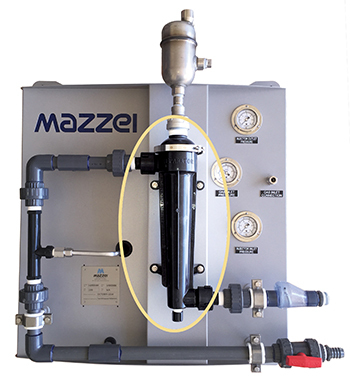 In Mazzei degas separators the water-entrained gas mixture enters the top of the separator tangentially, which causes it to spin. The water spins and flows down through the separator to the bottom where it is discharged. The entrained gases collect at the vortex where they pass through a collector and flow out the top of the separator. The separated gases exit the separator through a degas relief valve. The GDT degas separator is constructed out of several materials to serve in different applications including: Type 316L stainless steel, CPVC/FRP, and PVDF. Mazzei has experience with fabrication for unusual applications in alternate materials, ASME and CRN Code and operating pressure ratings. Please contact Mazzei to discuss your needs. 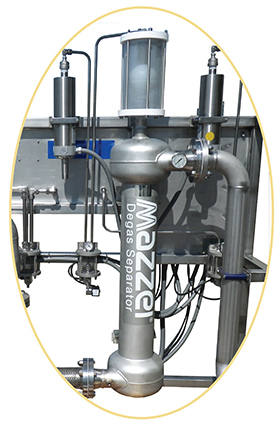 If You Wish To Customize Your Degas Separator, CONTACT MAZZEI For Availability.